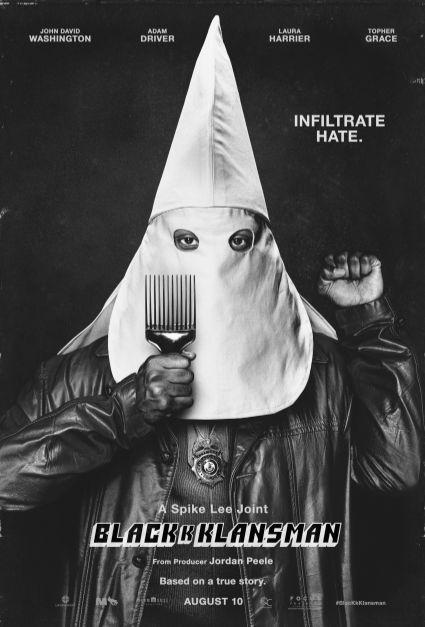 Sometimes comical, sometimes disturbing, Spike Lee’s movie, BlacKkKlansman, eloquently depicts the black and white picture of 1970 racism: literally. Set during a time when the lines separating acceptable and down-right offensive shift depending on what was for breakfast and the phase of the moon, BlacKkKlansman is like a bucket of cold, hard history relentlessly dumped onto the audience. The story of Detective Ron Stallworth, played by John David Washington, reminds us, in a most passionately political way, why we, as residents of Colorado Springs, are able to live our lives without racial segregation. The story begins with a young Ron Stallworth, the first black officer of the Colorado Springs Police Department, surveilling activist Stokely Carmichael’s speech for the Colorado College Black Student Union. Coincidentally, Ron discovers a recruitment ad for the local Ku Klux Klan and, after calling the number under the guise of a white supremacist, joins the KKK. However, because Ron is black, his partner in undercover crime Flip Zimmerman, played by Adam Driver, directly enters the Klan as Ron’s white persona, helping to turn the supremacists upside down in a series of pointedly intellectual battles. Although the plot begins with the police, the movie itself does not, instead, the audience is taken aback by a scene of hundreds of dead or wounded soldiers scattered about a railroad station, a shot concluded by a tragically gallant view of a tattered confederate flag, a clip from the globally famous film, Gone with the Wind. Right off the bat, Lee is excavating the presence of the legal, unquestioned white dominance of traditional confederate beliefs in the past and even now. Directly after follows a scene of fictitious Dr. Kennebrew Beauregard jeering at the audience about the “mongrel nation” that is America, about its “Jewish-controlled Supreme Court” and detestable “miscegenation.” It is later revealed that he was rehearsing for what was yet to come. Gone with the Wind isn’t the only ground-breaking film Lee makes reference to; in a later scene, D.W. Griffith’s work, The Birth of a Nation, is firmly held within the hands of the KKK Grand Wizard David Duke, played by Topher Grace, during a banquet for new initiates in Colorado Springs. “The Birth of a Nation,” though revolutionary in terms of cinematic prestige, was a colossal manifestation of the 1915 racist agenda that reinvigorated KKK members worldwide. Lee’s use of such a piece further points towards those traditional confederate beliefs still lingering behind modern anti-black sentiments. Colorado Springs may have been the seat of racist propaganda in the 1970s, but due to the efforts of Ron, Flip, and the local Police Department, it is now a diverse city free from the shadow of the KKK. However that doesn’t mean racism is completely out of the picture, not even for the nation and BlacKkKlansmen makes a point of that. Lee isn’t only blaming white supremacists for the return of radical racism; he’s blaming mainstream politics, with its focus on profit and ignorance over justice.